On Nov. 12, 2008, the U.S. Supreme Court will hear oral arguments in Pleasant Grove City v. Summum, a case that could change how public parks display religious messages such as the Ten Commandments. The Pew Forum provides a brief overview of how the case progressed to the Supreme Court and how the two sides — a religious organization called Summum and a city government — offer differing interpretations of the Free Speech Clause in the First Amendment to the U.S. Constitution to make their arguments. 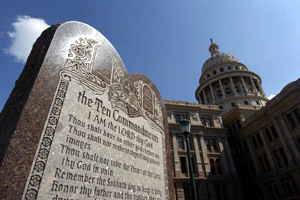 In 2005 the U.S. Supreme Court upheld the constitutionality of this Ten Commandments display at the Texas Capitol. The Summum case could change how public parks display similar religious messages. How did the lawsuit in Pleasant Grove City v. Summum arise? In September 2003, the Utah-based Summum religious organization, founded in 1975, sought to donate to the city of Pleasant Grove, Utah, a monument of the Seven Aphorisms — seven mystical principles that the group says explain the workings of the universe. Summum teaches that when Moses first went to Mount Sinai, he received stone tablets from God that were inscribed with these principles. Summum believes that because the Israelites could not comprehend the Seven Aphorisms, Moses destroyed the tablets and went to Mount Sinai a second time. According to Summum, Moses then returned to the people with clearer, more accessible rules now known as the Ten Commandments. Summum asked the city to display the Seven Aphorisms monument among the more than 10 objects already on display in Pleasant Grove’s Pioneer Park. Specifically, Summum requested that the city place the Seven Aphorisms monument next to a Ten Commandments monument that the Fraternal Order of Eagles, a primarily secular group, had donated to the park in 1971. When Pleasant Grove refused to accept and display the Seven Aphorisms monument, Summum sued, alleging that the city’s denial violated the group’s rights under the First Amendment’s Free Speech Clause. Summum contends that the clause requires the government to include in public parks all privately donated monuments, whether religious or secular, on an equal basis. According to Summum, Pleasant Grove’s exclusion of the Seven Aphorisms monument thus violated the group’s right to free speech. According to Pleasant Grove officials, however, the city did not violate the Free Speech Clause because the city was merely following its policy of accepting display donations only if the display either directly relates to the city’s history or the donor has longstanding ties to the community. In July 2005, Summum filed its lawsuit in the U.S. District Court for Utah. Shortly after bringing the suit, Summum requested that the court grant a temporary injunction, a judicial order that would require the city to place the Seven Aphorisms monument in the park until the court reached a final decision on the matter. One element of the legal standard for granting a temporary injunction is that the individual or group requesting the injunction must demonstrate a likelihood of prevailing in the case. After holding a hearing on this issue in February 2006, the District Court rejected Summum’s request for a temporary injunction on the ground that the group was unlikely to demonstrate a violation of its free speech rights. Summum appealed that ruling to the 10th U.S. Circuit Court of Appeals, and in April 2007, a three-judge panel on that court reversed the District Court’s decision and granted a temporary injunction. Chief Judge Deanell Reece Tacha’s opinion, which was supported by the panel, held that the Ten Commandments monument in the park was private speech, not government speech, because a private group had donated the display and the government had not claimed responsibility for it. Chief Judge Tacha then found that because a city park is a traditional public forum (a place the government creates for private individuals to express their ideas), Pleasant Grove could exclude the Seven Aphorisms monument only if the city’s reason for doing so satisfied the most rigorous standard of judicial scrutiny, known as “strict scrutiny.” Strict scrutiny would require the city to demonstrate that the exclusion was necessary to achieve a “compelling government interest,” which includes only the most powerful government interests, such as ensuring public health or security. Because Tacha found it very unlikely that Pleasant Grove could satisfy this high standard, the 10th Circuit sent the case back to the District Court and ordered the city to permit Summum to place the monument in the park until the District Court issued a final ruling on the matter. But Pleasant Grove challenged this order by requesting that the 10th Circuit conduct an en banc rehearing, in which all judges of a court are called upon to reconsider a decision. For an en banc rehearing to occur, a majority of the judges must vote in favor of the rehearing. In this case, the court split 6-6, so it denied Pleasant Grove’s request. One of the opinions dissenting from the denial of the en banc rehearing was written by Judge Michael McConnell, who is widely considered a potential Supreme Court nominee and highly regarded for his writing on church-state law. In his dissent, McConnell claimed that Chief Judge Tacha’s original opinion had erred in finding that the Ten Commandments monument was private speech. Indeed, McConnell argued, Tacha’s finding deviated from the many circuit court decisions holding that once the government accepts and controls a privately donated display, the display becomes government speech. McConnell said that because he considered the Ten Commandments monument and the other permanent structures already on display in the park to be government speech, a different set of Supreme Court precedents applied to the exclusion of the Seven Aphorisms monument. Under these less demanding precedents, McConnell concluded, Pleasant Grove retained broad discretion to refuse any donated displays, such as the Seven Aphorisms monument, that would undermine the city’s purpose for placing displays in the park. After the 10th Circuit denied Pleasant Grove’s request for an en banc rehearing, the city sought the Supreme Court’s review, which the high court granted in March 2008. What is Pleasant Grove’s argument in its brief to the Supreme Court for why the Free Speech Clause permits the city to exclude the Seven Aphorisms monument? Pleasant Grove argues that the 10th Circuit erred in two ways. First, the city contends that the 10th Circuit wrongly held that the park displays are private speech. Echoing the reasoning in 10th Circuit Judge McConnell’s dissent, the city argues that the original 10th Circuit ruling ignored the many circuit court decisions holding that when the government accepts, owns, controls and displays a privately donated monument, the monument becomes government speech. For this reason, Pleasant Grove concludes that the free speech rules governing private speech do not apply to this case. Rather, Pleasant Grove argues, the city’s exclusion of the Seven Aphorisms monument is subject to the less-demanding rules that apply to government speech. Pleasant Grove argues that because its exclusion can easily satisfy these less demanding standards, the Supreme Court must reverse the 10th Circuit’s ruling. Pleasant Grove further argues that even if the Pioneer Park displays were private speech, the high court would still need to rule for the city because the 10th Circuit erred by holding that the park is a public forum for permanent, unattended displays like the Seven Aphorisms monument. In making this argument, the city first claims that the park is not a public forum in and of itself. Rather, according to the city, Pleasant Grove created a public forum only in the context of its review process for selecting which donations satisfied the city’s criteria for displays in the park. Thus, Pleasant Grove concludes, the Free Speech Clause at most required the city to consider whether the Seven Aphorisms related to the city’s history and whether Summum had longstanding ties to the community. If Summum failed to satisfy these criteria, Pleasant Grove argues, the Free Speech Clause does not require the city to display the monument. In addition, the city claims that while Pioneer Park might be a traditional public forum for some purposes — including, for example, momentary expressions of private speech such as distributing leaflets or making speeches — the park could not become a public forum for the private display of permanent monuments unless the city specifically designated the forum for such a purpose. Pleasant Grove declares that because it has not designated the park for the private display of all permanent monuments, the city does not have to erect the Seven Aphorisms monument. What is Summum’s argument in response? Summum argues that even under Pleasant Grove’s own standards, the Pioneer Park displays constitute private speech. Indeed, Summum points out, the Fraternal Order of Eagles, not the city, inscribed the Ten Commandments on the monument. Summum also presents an additional argument for the displays being private speech, namely that Pleasant Grove never officially announced that the city had adopted and endorsed the message of the Ten Commandments monument. Summum also challenges Pleasant Grove’s claim that the city did not create a public forum for private, unattended, permanent monuments. Rather, Summum argues that by opening the park for displays, the city opened the park itself – not the city’s selection process – for private donations of all types of speech, including unattended, permanent monuments. In making this argument, Summum cites Capitol Square Review Board v. Pinette (1995), a Supreme Court case that arose after Ohio refused the Ku Klux Klan’s attempt to place an unattended cross in the Columbus, Ohio, Statehouse plaza during the Christmas season. The KKK claimed that this refusal violated its free speech rights. The Supreme Court agreed, holding that Ohio may not accept some displays, such as a lighted Christmas tree and a menorah, while rejecting other displays on the basis of their content. Summum contends that the plaza itself — not Ohio’s selection criteria — was the relevant public forum in the Pinette case. Moreover, Summum argues that while the high court said in Pinette that Ohio might have had the authority to ban all private, unattended displays, the court held that the government must not discriminate on the basis of content in accepting some displays while rejecting others. Since Summum claims that Pleasant Grove discriminated on the basis of content in applying its selection criteria to exclude the Seven Aphorisms monument, Summum argues that the Pinette decision requires the high court to rule in Summum’s favor. What might be the significance of the Summum case? As Pleasant Grove argues in its brief, a broad ruling in favor of Summum could mean that whenever a government accepts a display in a public park, it must then accept other displays containing all sorts of messages, even messages that the community finds distasteful or offensive. On the other hand, as Summum contends in its brief, a broad ruling in favor of Pleasant Grove might permit the government to censor speech in a public park by asserting that the government has taken ownership of all messages featured in the park. Although these broad rulings are possible, it appears more likely that the high court would issue a substantially narrower decision. How might the ruling bear on the First Amendment’s Establishment Clause? Summum did not allege that Pleasant Grove’s display of the Ten Commandments violated the Establishment Clause, which prohibits the government from endorsing religious messages for religious purposes; the group’s goal was not to exclude the Ten Commandments monument, but rather to include its own Seven Aphorisms monument among the other park displays. Moreover, if a court were to rule that the Establishment Clause prohibited the city from displaying the Ten Commandments, then the court also would likely rule that the clause prohibited the city from displaying the Seven Aphorisms. Even though Summum does not use the Establishment Clause in its argument, this case might lead to more litigation over the meaning of that clause. For example, if the Supreme Court rules in favor of Pleasant Grove on the grounds that the displays are government speech, the decision might induce other governments to take ownership of privately donated displays in their public parks — and thus bypass the Free Speech Clause restrictions that apply to government exclusions of private speech in a public forum. But as a consequence of making their park displays government speech, these governments might then have to deal with Establishment Clause restrictions that limit governmental endorsement of religious messages. Similarly, if the high court goes further and rules that all permanent displays on public property are government speech, then that ruling would bypass the free speech issue but would likely result in Establishment Clause challenges whenever governments accept permanent religious displays. Thus, the Summum case might invite increased litigation over whether government-sponsored displays of religious messages violate the Establishment Clause. The relevant Establishment Clause precedents on this issue are Van Orden v. Perry and McCreary County v. ACLU, two 2005 Supreme Court decisions that addressed the constitutionality of government displays of the Ten Commandments. In Van Orden, the high court upheld a Texas Capitol display of a Ten Commandments monument surrounded by many secular monuments. In McCreary, however, the court invalidated Kentucky’s placement of framed copies of the Ten Commandments in courthouses and public schools. The court distinguished these cases on the basis that, given the contexts, the Ten Commandments display in Van Orden had a secular purpose while the displays in McCreary had religious purposes. (For a more detailed discussion of government-sponsored Ten Commandments displays, see the Pew Forum’s Religious Displays and the Courts.1 ) If a court were to take on the question of whether Pleasant Grove’s display of the Ten Commandments violates the Establishment Clause, its decision would turn on these context-specific distinctions. 1 “Religious Displays and the Courts,” June 2007. Salazar v. Buono: Can Government Give One Religion’s Symbol Prominence in a Public Park?